Delta airlines is testing out iPads as “electronic flight bags” to make a pilot’s job easier. They’re jumping on the bandwagon because it turns out the iPad really could be a pilot’s best friend. Delta Airlines has deployed 22 iPads into its global pilot workforce, as a preliminary trial of the iPad’s ability to act as an electronic flight bag. They’re not the first to do so, with American Airlines bagging that title after they gained FAA approval back in 2010, but Delta’s move points to a growing trend among fliers–if your job or pastime involves gliding through the air, then the iPad is about to revolutionize the experience. For Delta, the iPads act as a lighter, more efficient and more up-to-date version of the little leather trolley case pilots usually have to haul around with pounds of flight plans, weather charts, and other paperwork they need to fly airliners. It’s part of a bigger digital overhaul for Delta, which has integrated Gogo’s in-flight Wi-Fi to its domestic fleet, enabling pilots to get up-to-date information and even company emails as they fly… and Delta’s also experimented with loaning iPads as entertainment units to customers. All Delta’s pilot’s tablets have the same core software, which contain charting apps, company flight manuals in PDF format, a custom meteorology app from Delta which includes the company’s own real-time radar data, an app for writing notes, and crew rest calculators for longer flights. The company can also push real-time security updates to all its iPad crew in-flight, and even direct them into new re-routes as they fly. Back in July 2010, Plane And Pilot Mag profiled 20 apps that were useful for pilots, ranging from the free and simple AeroWeather to Jeppesen, a professional grade app that details the approach procedures for airports around the globe, and one that Delta is using as part of its trial. 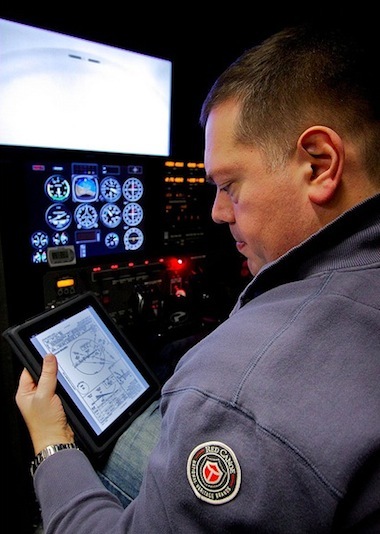 Everything from pre-flight planning to in-fight emergency weather updates can be delivered via the iPad–and if there’s an emergency, the manuals are all electronic and searchable, potentially saving vaulable time instead of having pilots flick through a paper copy. Proof positive that the iPad’s innovation is also changing the entire flight industry comes from British Airways: It’s trialing them as dynamic, real-time data tools for senior flight crew–helping them move passengers to connecting flights and replacing the paper-based manifests that have been law since commercial flying began. Bonus: American Airlines, during its iPad trial program, suggested that by ditching the heavy paper-based pilot flight bags for iPads, they’d save enough weight to reduce their annual fuel bill by $1.2 million. Which also means less polluting fuel is burned. Updated: This is now very much a trend–United Airlines is deploying 11,000 iPads to all its United and Continental pilots to make their cockpits paperless environments. The fuel and paper savings are significant, and the advantages of having “essential and real-time information at their fingertips at all times throughout the flight” are undeniable.